The following is an email interview I recently conducted with Bobby Schindler, brother of the late Terri Schiavo, whose notorious murder by starvation and dehydration occurred in 2005. 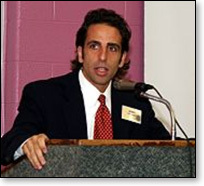 Mr. Schindler is the executive director of the Terri Schiavo Life & Hope Network. M. Abbott: It's been nine years (it sure doesn't seem that long) since your sister was killed by supporters of the death culture. Do you see any inroads being made in regard to countering the death culture and advancing a culture of life? Bobby Schindler: This is a difficult question to answer. On the one hand, every single day, patients are having their food and water (through a feeding tube) terminated, leading to their premature deaths. The deliberate starvation and dehydration of our medically vulnerable, something that not long ago would never have been tolerated, has become ordinary. The reason for this is mainly because the medical establishment is now defining food and water as "medical treatment" as opposed to basic and ordinary care. Incidentally, the Catholic Church does not adhere to this and still considers food and water through feeding tubes to be basic care. On the other hand, I do see some progress being made, mostly with the awareness being raised on this issue. It seems to me there is a growing concern among the general public with the reality of the government controlling our health care system – in particular, an increase in health care rationing. Indeed, it was with Governor Palin's reference to "death panels" as part of the threat of Obamacare that began the discussion. Since Governor Palin made these remarks, there have been enough articles written by some of our leading experts on this issue validating our fears that the formation of an Independent Payment Advisory Board (IPAD) will basically give the government the power to decide who will receive or not receive certain health care treatments. M. Abbott: In 2007, you wrote a letter to Bishop Robert Lynch (click here to read the letter in its entirety) that was highly critical of his inaction and virtual silence in regard to your family's tragic situation. He never responded; nor did he reach out to you or your parents in any way. Is there anything you'd like to say to him today that would differ from what you wrote seven years ago? Bobby Schindler: Bishop Lynch's actions prior to, and subsequent to, Terri's death speak for themselves. My hope is that we will see the much needed leadership from our clergy speaking out and educating the laity on this issue, particularly as it pertains to the administration of food and water through feeding tubes. Catholic teaching is clear when it comes to situations like that of my sister Terri. In fact, it was Pope John Paul II who addressed the matter of persons with profound brain injuries – those who are not dying and are being fed through a feeding tube. Essentially, the pope said that we are morally obligated to care for these individuals. However, it has been my experience that there is widespread confusion among the laity on this matter. As I already said, people are being deliberately killed every day in countless health care facilities, not only here in the U.S., but on a global scale. Until our clergy begin addressing the seriousness of this issue so the laity has clarity, patients' lives will be placed in jeopardy by loved ones making decisions contrary to the teachings of the Church. M. Abbott: What are your thoughts about Pope Francis and, in particular, his views on the life issues? Bobby Schindler: Perhaps some believe that Pope Francis is not as outspoken as some of his predecessors on the life issues, but the pope has made some strong statements regarding the Church's teaching on the sacredness of life. In fact, according to a January 2014 Catholic News Service article, Pope Francis quoted Pope John Paul's statement that "every violation of the personal dignity of the human being cries out in vengeance to God." In fact, just in the past few days, Pope Francis, speaking to the Italian pro-life group Movimento per la Vita, called abortion an "abominable crime," adding that the right to life is the central human right. Not to mention the photos we see of Pope Francis constantly embracing persons with profound disabilities. M. Abbott: What has the Terri Schiavo Life & Hope Network been up to in recent months? What do you hope to accomplish in the foreseeable future? Bobby Schindler: When Terri died in 2005, my family decided that we wanted to continue to help other families. Consequently, we established the Terri Schiavo Life & Hope Network. It was our hope to try and turn what happened to my sister into a positive effort of awareness, education and advocacy. In the subsequent nine years, our family has been involved in advocating for and supporting thousands of families, not just here in the U.S., but worldwide. Here is just one example of a recent call we received. A young man contacted us about his fiancée who experienced an asthma attack and went into cardiac arrest. It had been just a short time before physicians diagnosed her as brain dead. She initially needed a ventilator to help with her breathing. According to the young man, she began to shows signs of improvement. Despite this, her parents asked physicians to remove her ventilator, with the understanding that it would lead to their daughter's death. Physicians were wrong. When her ventilator was removed, she began to breathe on her own and, at that point, was being sustained only by food and water through a feeding tube. According to her fiancée, there were times when she was attempting to communicate. In spite of the signs of progress this young girl appeared to be making, and the desperate pleas from her fiancée, the girl's parents made the decision to remove their daughter's feeding tube and she was subsequently administered pain medicine. We received a message the next day, just past midnight, letting us know that this young woman had died. Sadly, we have dealt with too many similar cases over the years. Our future goal, and what we've been currently working on, is to create a network of rehabilitation centers in Terri's name that provide documentable progress for those persons with severe neurological disabilities and, in the process, demonstrate that these persons are living human beings whose protection ultimately helps determine a nation's survival.